Ankylosing Spondylitis (Bechterew’s disease or Marie Struempell disease as it is also known) is a form of chronic, degenerative arthritis that affects the spine and sacroiliac joints and often other joints of the body. Ankylosing spondylitis comes to light most frequently between the ages of 15 and 30. It can, however, occur before or after this time. The condition is more prevalent in men than in women, with around 1 in 200 men and 1 in 500 women being diagnosed with the condition in the UK. It is thought, however, that fewer women are correctly diagnosed due to the differing patterns of symptoms when compared to men. 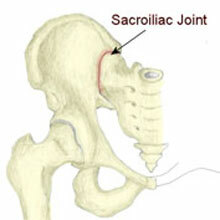 Stiffness and pain in the morning affecting the sacroiliac joint area and spine. Aching in the lower back which can disrupt sleep. Pain radiating down the legs and into the groin. Pain is worse during and after rest e.g. in the mornings. Exercise eases pain and stiffness. Aches and pains in the buttocks, neck, shoulders, hips and upper back. Symptoms may flare up and then disappear. Severe cases may cause feelings of illness, weight loss, and fatigue. Other complications may include recurrent eye inflammations, heart, lung, nervous system, bowel problems and over time, an increased kyphosis or curvature of the upper spine. Ankylosing Spondylitis (Bechterew’s disease or Marie Struempell disease as it is also known) is a form of chronic, degenerative arthritis that affects the spine and sacroiliac joints and often other joints of the body. The cause is currently unknown although there is a hereditary factor. The word ankylosing means fusion and the word spondylitis means inflammation of the joints of the spine. Inflammation within the spine and sacroiliac joints develops which also triggers the development of bony growths which often fuse the vertebrae causing pain and stiffness. Ankylosing Spondylitis is one of a group of arthritis conditions known as spondyloarthritides, including psoriatic, colitic and reactive arthritis. AS can occur in isolation or in conjunction with any of these conditions, as well as Crohn’s disease, psoriasis, and osteoporosis. No two cases of AS are exactly the same. Variations occur in the distribution of pain, stiffness, inflammation and in the length of flare-ups and course of the disease. In some cases, the disease becomes less active and pain may cease altogether. Exercise such as swimming can be great for ankylosing spondylitis as it places very little strain on the spine and joints. Other exercises for mobility and back strength can also be beneficial. Do a blood test and x-rays to confirm the diagnosis. Prescribe exercises and physiotherapy to maintain good mobility and posture and counteract the stiffening of the spine. Prescribe other disease-modifying drugs or injections. Surgery is rare although may sometimes be used to restore movement or straighten the spine in extreme cases.